GRRen is a new product from Greenbriar Studio. It is a Renderman style renderer that is optimized for polygon models instead of nurb based models. In its first release, it includes all of the Renderman features that Toolbox uses in other renderers except ray traced shadows. It also has some specific additions that we wanted, things that are difficult, or very time consuming, to do in other renderers. It has a built in single pass cartoon cell shading system. 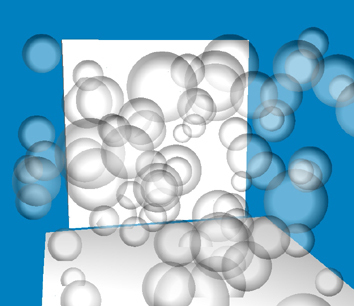 It also has built in automatic transparent shadow maps. We have also created it so that not only can it run as a command line app directly from ToolBox, but it also has a GUI so a user can use it to run single items, change settings and kick off batch jobs. This allows for easy use as a mini render farm. 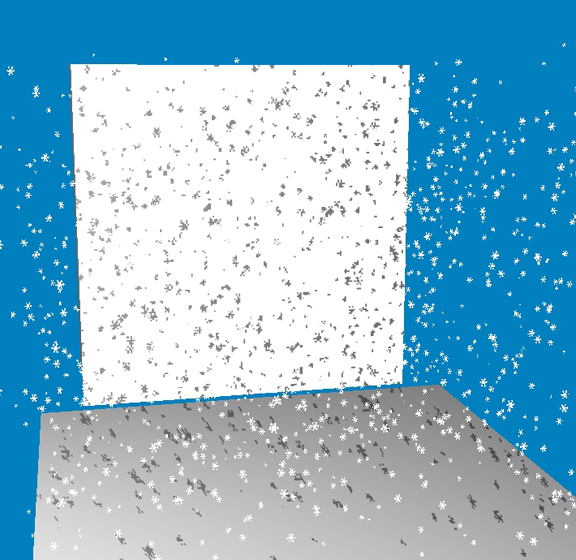 It also supports a special particle system that allows texture, trans and bump mapping of particles, plus spherical shading of particles, which can be of any size. Version 1.1 adds ray traced reflection, refraction and shadows. 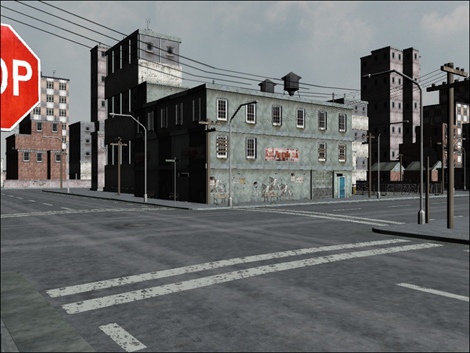 Plus true displacement mapping. GRRen supports any size of output render. It is not limited to broadcast or DV. We test at 4000x4000 pixels at 4x4 anti aliasing (256,000,000 pixels per frame!) to check for size and memory issues, but there is no actual limit, just memory and disk space! It is a film quality renderer. The first release supports the Renderman RIB file format, but has a hard coded shader that just supports the shading functions that Toolbox uses (you have to start somewhere! Our eventual goal is to be a fully Renderman compatible renderer, but it will take several steps to get there). The next major release will be the addition of the Renderman Shading Language to GRRen. A renderer is a very large project, the goal for the first version was to be able to support everything that ToolBox uses except ray tracing, plus some things we wanted but couldn't get anywhere else. Why write a new renderer? The need for a personal render farm for animation, and a renderer more polygon oriented, were the main reasons behind creating this new product. An affordable render farm was an important goal. And since speed is a major issue for animation vs still images, ray tracing is not in the first release, but will be added as the product progresses. Since Renderman had the original goal of 3 minutes or less per frame, ray tracing is not really useable for film work, except in very small amounts. But we plan to add it as the third major update on our road map. So now with Toolbox, you can do everything from creating the first point and face of a model, through rendering large scale movie quality output frames with sound! GRRen has a single pass, built in, cartoon cell shade renderer. This is one of the things that is difficult to do in most renderers, requires multiple passes and still does not have some features we needed, such as the ability to outline different material areas on the same mesh, even when they are flat to each other. In addition to all the realistic ways you can shade an object, GRRen also supports single color cell shading and dual color cell shading, with user specified or auto generated shadow colors, outside of object outlines and material area outlines. We even have a special Mixed render mode, so some objects can be realistic and some cartoon. We support transparency and cartoon shadows (where shadowed areas are the specified shadow color, not black). GRRen has built in regular and transparent (Deep) shadow maps. Since time required is the same, ToolBox only uses the Transparent shadows. What are transparent shadows? These are shadows that track the light and its color that passes through semi transparent objects. So instead of a black shadow from a transparent object, you get a shadow the color of the object, the darkness of which is set by how opaque the object is. The shadow tracks through any number of transparent objects. While ToolBox is my only Windows only app (due to porting it being such a gigantic task), GRRen was written to be multi platform. You should be able to use any type PC in your render farm. It is currently available on Windows XP and Mac OSX Universal. Linux version is under construction..
Includes both Windows and Mac versions and two licenses. Single extra license for either Windows or Mac. Six extra licenses any combination of Windows or Mac. Bug fix Updates to GRRen are free. Due to the nature of this product, there will be a charge for major level upgrades. Download the current manual for ToolBox and GRRen. 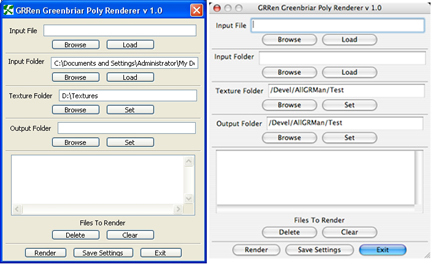 Demo copy of ToolBox including GRRen demo now available. 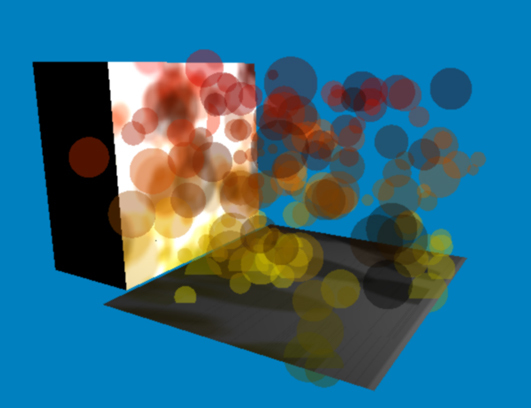 Various sized and colored semi-transparent particles casting colored shadows. GRRen now Available for Windows and Mac! Special sale price for May for new ToolBox IV and GRRen Combo! See Announcements on site front page! Trans mapped particles to create snowflakes, with our shadow maps creating snowflake shaped shadows! Vous pouvez nous email en francais ou anglais.